This entry was posted on 28th March 2019 by Judith. In Ireland, there are 98 different species of bee. There is the honeybee (a managed pollinator) 20 bumblebee species and 77 solitary bee species. In 2006 scientists published a Red List of Ireland’s Bees. It showed that one third of our 97 wild bees are threatened with extinction and ufortunately a third of all bee species in Ireland could be extinct by 2030. This problem can’t be solved simply by increasing the number of honeybee hives. Bumblebees make their nests on the surface of the ground or just underneath, often in long grass, bracken, or at the base of a hedgerow. They generally have between 50-200 workers in a nest. Honeybee hives typically contain 50,000 bees, so bumblebee nests are very small in comparison. Solitary bees are often extremely efficient pollinators. Studies in apple orchards have shown that a single mason solitary bee can do the work of hundreds of honeybees! Some solitary bee species are tiny and look like flying ants, others have black and yellow striped bodies like wasps. Some are larger and hairier like bumblebees. Increased use of pesticides – especially systemic neonicotinoids - could well be the culprit here. These are bad news for all pollinators and insects. The rapid changes in farming – from extensive to intensive, mixed to monoculture – have sounded the death knell for many species. We are also too tidy and remove weeds (food) and shelter for the wild bees. Don’t cut your grass until mid-April - after the Dandelions have flowered but before they set seed. 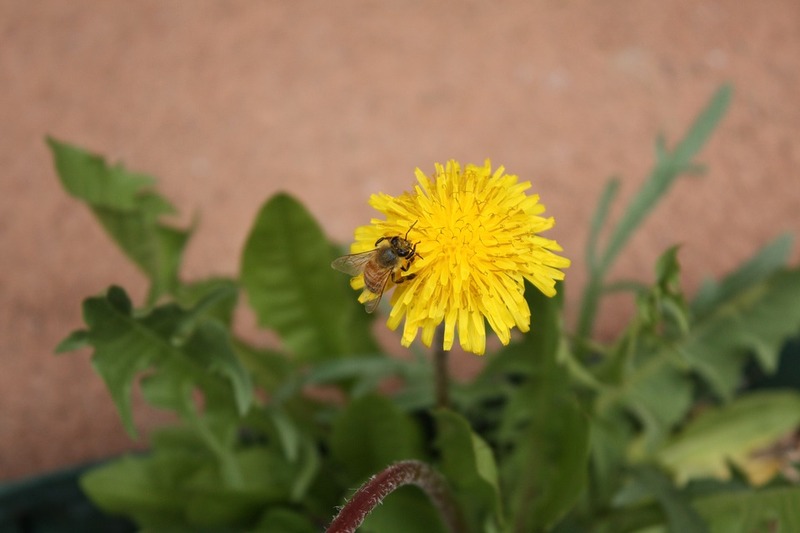 Dandelions provide a vital source of spring food for pollinators as do clovers, thistles, ivy, nettles and brambles. Consider cutting some areas of your lawn on a 6-week rotation. This will allow flowers to bloom, providing more food for pollinators. Take grass cuttings away from the lawn and don’t fertilize it so it will become a better environment for wildflowers to grow. In order to survive, pollinators and bees need flowers that produce lots of nectar (for energy) and pollen (for protein). If you want to make your garden pollinator friendly try to have nectar or pollen-rich flowers in bloom for as much of the year as you can. Always go for single flowered varieties – double flowered varieties provide almost no nectar and pollen for pollinators. Perennial plants are generally better sources of pollen and nectar. Aim for spring and autumn food - critical times for bees. Sow a wild flower or bee meadow. The bee meadow is particularly good as it will provide food in spring and autumn. Plant some trees if possible. Bee friendly trees include the native hawthorn, hazel, alder, rowan, crab apple, willow, horse chestnut, ornamental cherry and most fruit trees. The flowers of many common garden shrubs such as berberis, forsythia, potentilla, lavender, rosemary, mahonia, viburnum and cotoneaster are also excellent sources of food. Many pollinator friendly herbs also grow well in pots. Chives, Lavender, Rosemary, Sage and Thyme are good examples. Green manure or ‘cover crops’ are plants grown specifically to be dug back into the soil to improve its fertility and strusture. 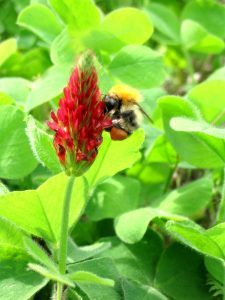 While in flower green manure plants can be great for pollinators, e.g. Buckwheat and Phacelia provide lots of pollen and nectar. If you grow vegetables, let your winter kale and broccoli go to seed – pollinators love the yellow flowers! Consider planting hedgerows made of flowering trees and shrubs such as Hazel, Willow, Blackthorn and Hawthorn. Let the grass at the base of the hedge grow wild. Maintain the hedge in stages so that there is always something flowering in spring. Bumblebee colonies nest in long grass or in abandoned rodent holes. Bumblebees often nest in the long grass at the base of flowering hedgerows. Leaving a wild area at the edge of the lawn or letting the base of hedgrows grow wild are both good ideas. 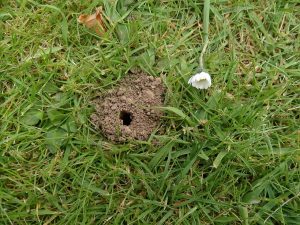 Solitary mining bees need areas of bare ground to be able to burrow into the soil and create their nests. Scrape away some grass in flat, sunny spots in your garden to create areas for these bees to nest. 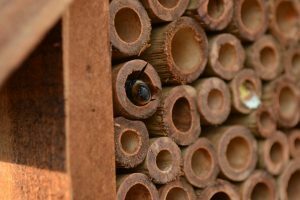 Other solitary bees will nest in hollow stems or holes in wood or stone walls. Resist the urge to tidy your garden in autumn – the hollow stems of many plants provide nesting for solitary bees. You could also make a bee hotel from hollow canes. As already noted you can leave your weeds to flower and cut back on the grass cutting. Don’t be to tidy in the garden, especially in autumn. Never use herbicides, pesticides or insecticides. These are the kiss of death for most insects, pollinators or bees. If they are systemic they will have a much wider reach as they are absorbed into the food chain, effecting small birds and mammals. Dispose of household chemicals properly – allowing them to enter waterways (which insects drink from) is not a good idea. Grow organically - this is win win all round. Better food for yourself and a better environment for nature to thrive. If possible buy organic food as this will have been grown in a nature friendly manner. Plant green manures – especially phacelia or crimson clover. Heaven for bees! When buying seed, plants or bulbs, chose ones that are organic. These will not have been sprayed with insecticides or herbicides. Become a beevangelist – tell your friends and family about the plight of the bees and encourage them to get involved. If you live on a housing estate then organise wild areas for bees – and get kids involved as they can spread the message at school. National Biodiversity Data centre has an All Ireland Pollinator Plan. It is an excellent source of information. Irish Wildlife Trust has a lot of useful information on biodiversity. This is a useful list of bee friendly garden plants from the Dublin bee keepers association. The Organic Centre, Leitrim offers lots of courses on organic growing.